Practically every European will be familiar with (or at least have heard of!) the coastal town of Marbella and its neighbouring marina Puerto Banús. Both of these charming resorts lie on the southern coast of Spain and are rightly known for their cultural ambience, fantastic amenities and the luxury lifestyle that they afford. Just a few steps north of the famous Puerto Banús lies yet another area of splendid Spanish real estate called Nueva Andalucía. Lesser known but now just as desirable as its famous neighbours, this region offers many of the same positives to enable living the ideal life in the sun, with a few additional incentives of its own. Aesthetically Nueva Andalucía is as beautiful as other parts of the Coast del Sol. The area is dotted with attractive residential developments that nestle charmingly within a green valley, which looks down onto the blue waters of the Mediterranean. An important part of this attractive district is the Golf Valley, where numerous golf courses fan out across the hills and slopes to create one of the best golf centres in Europe. Superbly designed and all featuring their own character, the enviable club list includes the renowned La Quinta Golf & Country Club, Real Club de Golf Las Brisas and Club de Golf Aloha. Numerous restaurants, bars, cafés and shops have been attracted to the area, offering residents a great choice of eateries and retail outlets that range from designer fashion shops to kiosks selling sweets. Every Saturday the centre of Nueva Andalucía opens its doors to arguably the best street market on the coast – and the streets and plaza bustle with life as a multitude of stalls sell clothes, paintings, fresh produce, toys, herbs and flowers. Finally: location, location, location. The age old premise and the three points to consider when buying any property are more than met when purchasing real estate in Nueva Andalucía. It is in walking distance to the coast and Puerto Banús, a five minute drive from Marbella and San Pedro Alcántara, and enjoys easy road access to Estepona and the city of Málaga. 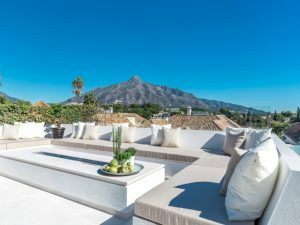 This popular residential suburb of Marbella is therefore situated perfectly for residents to access every amenity and facility available in the region, as well as the beach life that awaits them on the coastline. If you would like more information about Nueva Andalucía and the real estate available here then please contact us. Nordica Sales & Rentals is a professional and highly respected property company that specialises in selling and renting quality real estate in Marbella and its surrounding areas. When Nordica met the movie industry!